Today I share with you 5 of the well guarded secrets behind the front desk of every hotel! #1 If you book from a discount offering website, you’ll get discounted service. Yes y’all. That’s the slimy and obvious truth of the hospitality business. All because these discount offering websites eat into their profits and their motivation to give the customer a fulfilling experience. Two words to the wise : HOME STAY! #2 Front Desk Agents will get you faster than Karma will. Ever wondered why the second set of the automated key didn’t unlock your door? or that Room Service conveniently “misses” your room because it had the do not disturb sign on the lock, even when you didn’t put it there?! #3 A well worded complaint will be addressed a lot quicker than a gut wrenching and totally deafening scream. #4 “All our rooms are basically the same ma’am” is utter nonsense. It is true though. Because if you look at them in terms of the bare essentials, it’s all the same. But, here is where size matters, and a lot. (pun unintended.) So if you booked during off season and still got the corner room, then you could try tipping the front desk agent and “they’ll see what they can do” (read : upgrade based on your tip amount). However, you might want to keep a tip amount to a moderate low, because some people just want to see the world burn, so they will take your tip, and sit on it while you suffer in the corner room you tried to tip your way out of. Word to the wise : combine with the tip in #2 and you should be good to go! 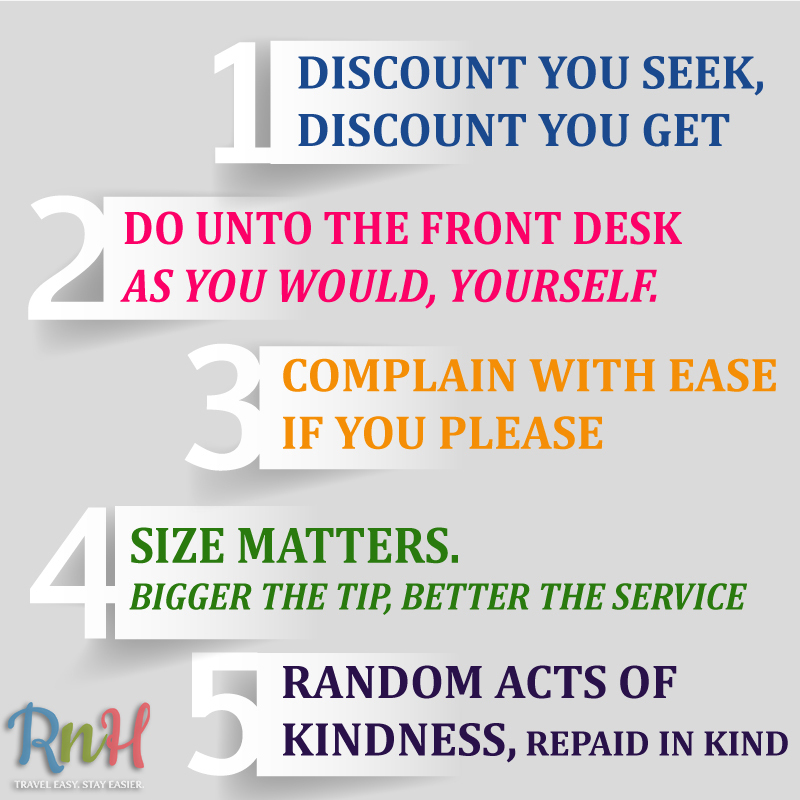 #5 The nicer you are to people around you, the better service you’ll get. So let the Bell Boy wheel your luggage around, tip him. Thank room service, and be nice to the people who serve you. You don’t want them to spit in your food. If you’re good enough, they might even exclude minor items from your food bill and label them as “on the house”. It’s as easy as that. True Story. I’ll just sum up our findings, as rules to travel smart perhaps..
And with that, it’s time for me to go. Be smart, and stay comfortable!